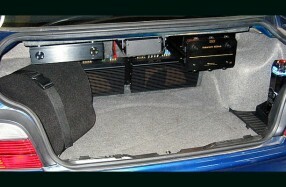 A complete Nakamichi Mobile Sound System - VERY high-end. Installed in 2005 and still out there being enjoyed. Below, 2 x 1000-PA 4 channel amplifiers 50watts rms per channel. These are all part of "Project 1000" Nakamichi's flagship, released in 2005. Subwoofer enclosure 2 x SP-1010 Nakamichi Subs in isobaric formation and vented.